Candidates applying for jobs through BPNL Recruitment must not exceed the upper age of 45 years and not below 18 years as reckoned on 01-09-2018. 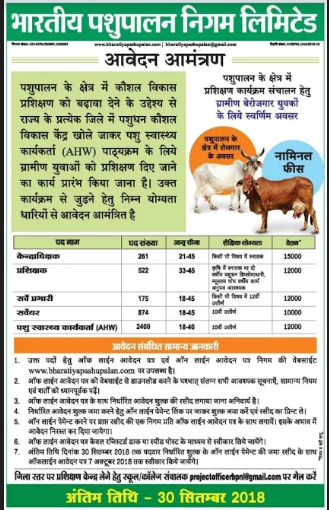 Candidates interested to join Animal Husbandry have passed 12th class and secured Degree/Diploma in Agriculture or Horticulture from a recognized University/Institute. Applicants who have successfully applied within the stipulated time will be selected on the basis of Written Examination as per the educational standards prescribed for the post followed by interview and Document verification. 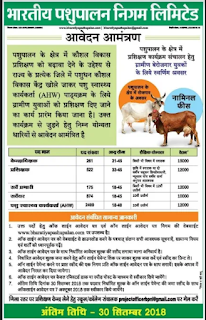 Candidates interested to join Animal Health Care Centres under desired post must apply online through the official website http://www.bhartiyapashupalan.com/ on or before 30th September 2018.